Step away from the crape myrtle! Now put down those pruning shears. Slowly! You were about to commit a crime against Nature by topping that tree. 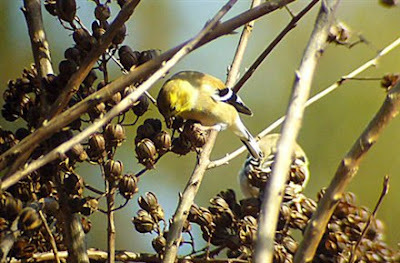 Goldfinches love crape myrtle seeds almost as much as they love thistle seed! Another goldfinch in its winter dress poses among the seed pods. Many seed eating birds will feed on the seed pods of the crape myrtle in winter. I have personally seen Northern Cardinals and Chipping Sparrows partaking of a meal on the trees in my yard, but none of the birds love those seeds as much as the little American Goldfinch. 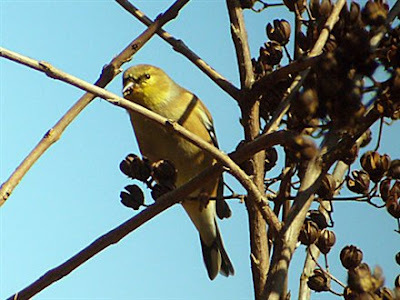 Almost any time of the day that I look out my kitchen window in winter I can count on seeing goldfinches eating the seeds of the crape myrtles along our fence. Pruning crape myrtles just now will deprive the lovely goldfinch, as well as other birds, of an important source of nutrition in the coldest part of winter. Now, admittedly, we don't usually have extended cold weather that is a threat to the lives of well-insulated birds, but still, finding food is harder for birds in winter. I say anything that we can do to make it a little easier for them we should do. Sometimes, making it easier for wildlife means tolerating a little untidiness in our yards. 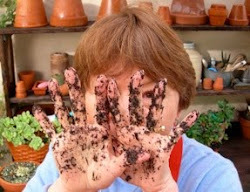 It may mean leaving seed heads or dried berries on plants a little longer than we normally would. Perhaps it means not pruning away that dead limb immediately (unless it is a safety hazard, of course), but leaving it there to attract insects which attract woodpeckers, nuthatches, warblers and other insect-eating birds. It might even mean leaving a dead tree standing on your property, if you live in an area where you can do that. Birds and other animals absolutely love dead trees! They are a source of food and can also become a place of shelter where cavity nesting birds can raise their young or where they can roost on cold winter nights or in bad weather. Birds also love brush piles. If you can stack the dead limbs that you prune in some out-of-the-way corner of your yard, you will make the little birds in your neighborhood very happy. This brush pile, by the way, is also an excellent place to deposit your Christmas tree - that is, if you had a live tree that was cut. The evergreen branches will provide shelter for the birds for weeks to come. Not only crape myrtles, of course, but many of the shrubs and trees that we have in our yards produce food that is important to birds at this time of year. The one that springs readily to mind is the holly. We grow many different varieties of the holly in our landscapes and almost all of them produce berries that are loved by birds such our permanent neighbor, the Northern Mockingbird, and our dapper winter visitor, the Cedar Waxwing. As its name implies the Cedar Waxwing also will feed voraciously on the fruit of the cedar and junipers, many of which are staples in our landscapes. The stories of waxwings and even American Robins becoming intoxicated on the fermented fruit of junipers are not just a suburban legend. It actually happens, but, in my yard at least, such fruits disappear down the gullets of the birds long before they have a chance to ferment! The goldfinches and other birds - not to mention the crapes - will thank you for waiting. And that, my friends, is what gardening with Nature is all about! Note: This entry was first published in early winter. Here in mid- to late February, it actually is okay to prune your crape myrtles if they need it. Most of the seeds are probably gone by now. But, please, please don't top your trees! Cool post. I don't think you can put it up too often. Seeing murdered myrtles makes me grind my teeth when I drive in town. 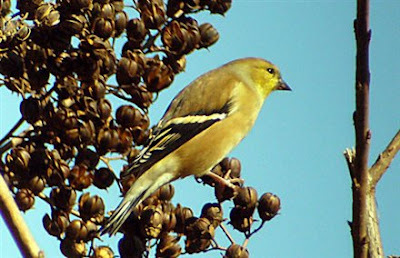 And I didn't know goldfinches loved crape myrtle seeds. Thanks for sharing. When the goldfinches arrive in my yard in December, they immediately descend on the crape myrtles in the neighborhood. They only start coming to my feeders in January when the crape myrtle seeds start to run out. I recently posted about crape murder as well. 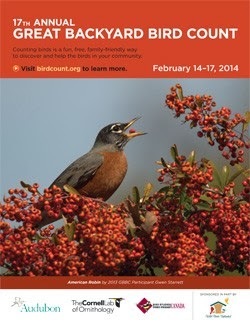 I've seen all the birds you mention at the crape seeds, as well as titmice and chickadees. I still can't get over how many people keep topping their crape myrtles. We've had an explosion of it in my town in the last week. It is so darned frustrating! My newly found love for these gorgeous trees now enhanced by being able to feed birds too. We will plant more. I love their "naked" trunks, bright flowers,and spectacular fall foliage.